There has been much discussion lately about humankind’s shift to digital storage for music, movies, and photos and how entire decades worth of documentation could be lost if those storage services failed. Would archaeologist of the future look back upon what we think of as a technologically advanced time because there is little physical proof of our art, culture, and activities? What about comic books? We are seeing a switch to people reading digital comics and while comic book color artists have been creating their artwork with the computer for years only now are pencillers and inkers making the switch in any significant numbers. These pencilers and inkers are coming to realize something color artists have faced since the beginning, when the artwork is created digitally there is no longer an original piece of artwork to sell at comic book conventions. Making it much more difficult to attend comic book conventions that are becoming increasingly more and more expensive for creators as discussed in last month’s Pros & Cons. If you attend comic book conventions what do you sell? If you do not attend conventions what are the main reasons? The response was fast and furious leading to 35 replies from other professional comic book color artists in only a few hours time. There was division on some issues and consensus on others. To attend conventions or not? Sad to relay many professional cmic book color artists report being fed-up being treated as second class citizens or worse by convention promoters. It would seem a good number of color artists have given up on conventions completely, stating their last convention appearance was 4 or 5 years ago. It does seem many feel pushed out or left out. Over and over again color artists complained about the expenses being too high to consider. A color artist makes about 25% or less what a typical penciller makes so what may seem reasonable to one member of the creative team may be completely unobtainable to the other. 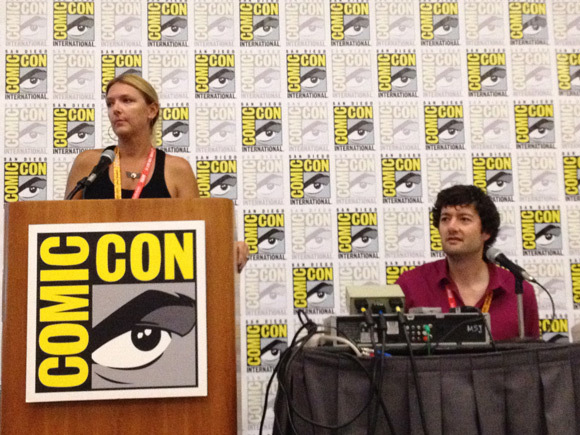 Other color artists stated the accelerated deadlines as a major factor in their decision to rarely attend conventions. 10 years ago comics were generally produced 3-6 months in advance of their publication dates. A typical comic book today is more hectic and chaotic than in years past with most color artists working on each issue up until the day it goes to press. This leaves little time for promotion or convention appearances. Many color artists also comment on how the publishers do little to support them when it comes to conventions. 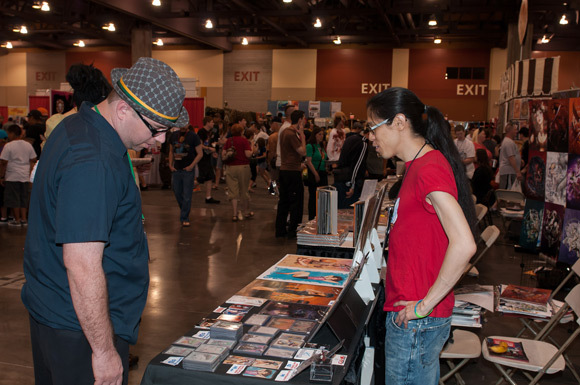 The publisher may work with the convention to ensure a writer or penciller gets an artist alley table and a badge and on rare occasion a creator may even make the guest list. The publisher may choose to cover all or part of the hotel and airfare cost for these creators as well. More often than not the publisher does not include other members of the creative team, like color artist, in their planning. On a personal note, I was once contacted by a major publisher who asked if I was going to be at one of the large conventions. I said yes and they asked if I could stop by the booth, and sign a few comics, and participate in a panel. I was very impressed as the other publishers I had worked with were not like this. I told Kristy about the positive experience over lunch and she immediately burst my bubble, “Don’t you think they were trying to contact Bryan Q. Miller?” Ugh, I knew she was right. How could I even imagine they would want a color artist at their booth? After lunch we got back in touch with the publisher and let them know I was thrilled to be included and happy to participate but wanted to be sure they knew they were speaking with Hi-Fi’s Brian Miller, not writer Bryan Q. Miller. There was a bit of silence on the phone then, “Oops, my bad. Thanks for the clarification, I’ll call Bryan Q. Miller right away”… click. I think that sums up the way most, not all, conventions and publishers think of color artist when it comes to promotions. We simply are not on the radar. But why not? It isn;t like 99% of all comic books sold are black and white? No, the majority of comics rely on color artists as part of the visual storytelling team. Clearly color artist are not receiving equal mind share when compared with other comic book creators. To sell prints or not to sell prints? This is certainly the issue causing the most stress, confusion, and arguments among professional comic creators. Those color artists who reported they do sell prints listed prints as their top selling item. For most, this was how they were able to recoup the majority of their convention expenses. The creators on the other side did not sell prints because they were worried about being fired by their publisher (or worse) if caught selling prints. There was at least one high profile case last year of a publisher winning a suit against a creator who was selling prints and this is certainly weighing heavily on the minds of other creators. Some don’t think it is worth the risk, others clearly do. There is also complaints about unfair competition at conventions. The situation where a non pro can show up with a bunch of un-official, un-licensed comic book artwork and sell, sell, sell without fear of repercussion. These artist have never worked officially or been published so they have nothing to lose. Where as the professional creator is officially very limited in what he or she may offer for sale. These non-pros generally show up with boxes of color laser copies and sell them to unsuspecting attendees who have no idea the sellers are not professional comic book creators. “Wow, a batman print signed by the artist for only $25? What a deal?” If only they knew the truth. The convention would sign a licensing deal with the major comic publishers allowing professionals with published credits to create an exclusive lithograph for that convention. The right to make a print would also be tied to artist alley and guest tables creating incentive for the convention to include more comic book creators in their show. If there are 50 artist alley tables there would be 50 unique creations, if there are 150 artist alley tables there are 150 unique creations, and so on. 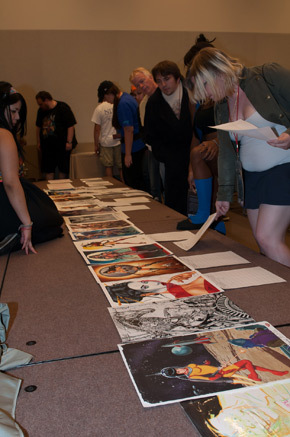 Each published professional would turn in their lithograph concept for approval. Once approved the creator could create a print run of no more than the agreed to number of copies of the print (Star Wars Celebration limits prints to 250 pieces as an example). Fans can not take possession of prints until the the show is open. Creators can accept pre-payments from people who will pick up their prints at the convention but can not pre-sale and ship prints to fans not attending the convention. If a creator does not sell all of their prints at the convention then the creator has the right to sell prints after the show. If any creator is found breaking the rules they are banned from the convention for one year minimum. This is a win for fans. They get 100% authentic licensed artwork by industry professionals. Some fans will try to collect all the con exclusive prints. This is a win for the conventions. Who sell out their artist alley tables faster and receive a licensing fee from each artist who contributes. Plus they have unique convention exclusive artwork. This is a win for creators who have a legitimate lithograph of their work to sell without fear of repercussion and have a better chance of breaking even or even making a profit at a comic book convention. This also eliminates the non-pro from competing in this area of officially licensed merchandise. Could a system like this work? It has proven successful for Star Wars Celebration and could possibly be adapted for comics with a little cooperation between conventions, publishers, and creators. Setting up a laptop, iPad, or flatscreen and demonstrating digital color seems to be the number one technique color artists are using to draw people to their tables. Much like pencillers can sit and sketch to draw a crowd, color artists are setting up hardware and software to demonstrate their talent and skill. One note is some convention spaces charge for electricity making this type of promotion hit or miss depending upon the convention. Some color artist are also worried about having the equipment they use to make a living damaged or stolen while at the show. That said, fans and other creators are always blown away when seeing how much creativity goes into painting the colors for a comic book page and live demonstrations do more to increase the the fan’s understanding and appreciation for color artists than just about anything else a color artist can do at a convention. A few color artists commented that they offer some sort of sketch coloring at conventions. This can be coloring other artist sketches using copic markers, or creating their own full color sketches for fans. This seems to be a niche skill among color artist as several commented they were not comfortable doing this while others were passionate about it. At least one color artists has created fully painted commissions at conventions as a way to offer something unique for fans. These are comic book convention issues comic book color artists are dealing with today. As more and more penciller and inkers dabble in digital content creation these problems will plague creators on a larger scale. Working to find solutions to these problems now will ensure a wide variety of comic book creators attending your favorite convention. When the archaeologist of the future look back are our visual storytelling it would be nice to have all creators represented. Working together we can showcase the best each member of the creative team has to offer and do so in a way that is fair and equatable to all. Do you have an idea to help showcase the work of comic book color artists? Leave your comments below, you can connect with Facebook, no separate log-on required.